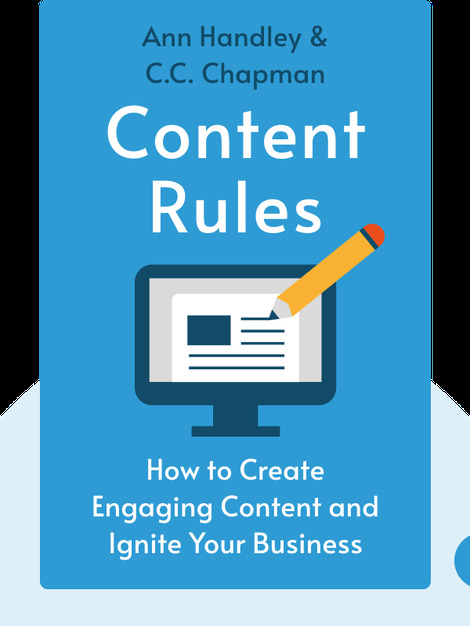 Content Rules (2012) is a guide to content publishing that’ll help you implement effective and sustainable strategies. Regardless of whether you’re a social-media novice or a web-savvy pro, these blinks will guide you through the ins and outs of web-based content tools and social media sites, while offering plenty of helpful content tips along the way. Ann Handley is the Chief Content Officer for MarketingProfs, a company that offers marketing resources and training to 442,000 subscribers. She is the author of Everybody Writes: Your Go-To Guide to Creating Ridiculously Good Content, a Wall Street Journal bestseller. C.C. Chapman is a marketing consultant who, in addition to creating DigitalDads.com, co-founded the marketing company The Advance Guard. His previous positions include VP of New Marketing for the design-marketing firm, Crayon. [Ann Handley, C.C. 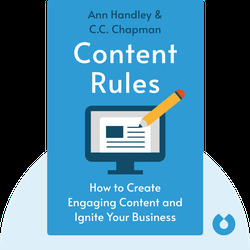 Chapman: Content Rules] copyright , John Wiley & Sons [Inc. or Ltd. as applicable] Used by permission of John Wiley & Sons [Inc. or Ltd. as applicable] and shall not be made available to any unauthorized third parties.